To drive footfalls and attract brand value, mall developers across the country are rolling out the red carpet for prominent chains. Recently, H&M signed a lease agreement with a Hyderabad mall developer, wherein the latter gave the Swedish retailer six months rent-free, promised an investment of Rs 2.5 crore on fit-outs (a term used to describe the process of making interior spaces suitable for occupation) and a 30-year lease, according to a source. This was over and above the fit period of three to four months. According to sector experts, department stores ask and get a rent-free period of three to four months during which they do fit-outs, and get a lease period of nine-odd years. 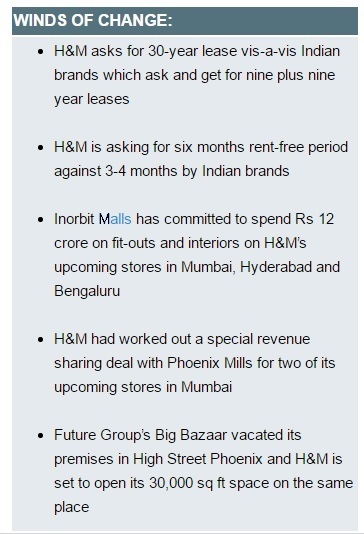 According to the same source, Mumbai-based Inorbit Malls has committed to spend Rs 12 crore on fit-outs and interiors on H&M’s upcoming stores in Mumbai, Hyderabad and Bengaluru. Inorbit’s public relations agency did not want to comment. 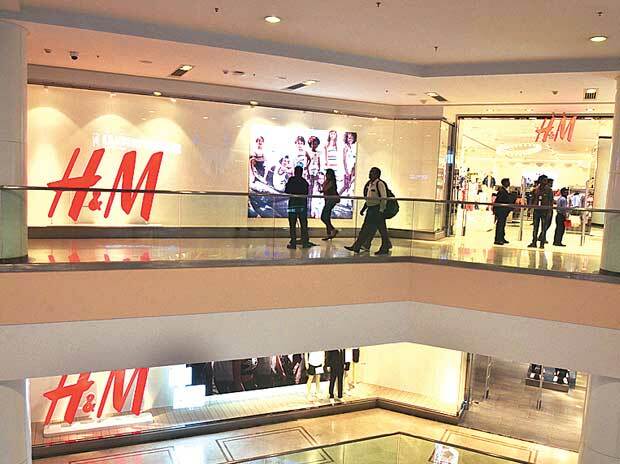 Yogeshwar Sharma, executive director at Select Citywalk, which houses both H&M and Zara, says they gave a rent-free period of six months as H&M was new to the country and it would help the brand to settle down. However, he denied the mall spent money on fit-outs and interiors. Sharma said the mall had given a rent-free period of four and a half months to Zara when it opened in the mall. “Indian brands do not enforce longer rent-free periods,” he said. Adding that in the longer view of the mall, they sign 30-35 year leases with global brands. A Zara spokesperson said: “We cannot comment on our commercial relations.” Sources said H&M had worked out a special revenue sharing deal with Phoenix Mills for two of its upcoming stores in Mumbai. Though there is a buzz that Phoenix Marketcity in the Kurla area had paid for fit-outs of Zara, Rajendra Kalkar, president-west at Phoenix denied this. Recently, Future Group’s Big Bazaar vacated its premises in High Street Phoenix and H&M is set to open its 30,000 sq ft space on the same place. “We give the same treatment for all good brands and there is no preferential treatment for any,” Kalkar said, adding every deal was based on commercial negotiations and different from each other. Devangshu Dutta, chief executive at consultancy firm Third Eyesight, said international marquee brands are seen as crucial anchors that can drive high footfall to malls. According to estimates, footfall at malls are down 20-25 per cent in the past couple of years, due to economic downturn and onslaught of e-commerce. Correspondingly, occupancy costs have also come down by about 15 per cent. “Zara and H&M have already demonstrated the excitement they are able to generate, not only at launch but the traffic they are able to sustain over time,” Dutta said. As far as recovering the income lost during rent-free periods or co-investment in initial store fit-out, developers would be working that into their commercial mix, and looking to recover that from other tenants or to amortise it over a period of time, he added. Mall owners, he went on, believe they'd be able to recover the investment on fit-outs and interiors in a few years, as the new brand will add value to its tenant mix and offer customers a new brand, impacting in better rental realisation from other tenants, too. Many malls had shut down in Mumbai, Bengaluru and other cities in the past couple of years, due to low footfall and business. Beside Nirmal Lifestyle in Mulund, Neptune Magnet Mall in Bhandup and Centre One in Vashi, malls that have closed in Mumbai include City Mall and Mega Mall in Andheri, and Dreams Mall in Bhandup. Kohinoor Mall in Kurla is yet to become functional. Eva Mall on Brigade Road and Sigma Mall on Cunningham Road in Bengaluru have shut shop. Navi Mumbai has seen Gold Souk Mall, Wedding Mall and Palm Beach Galleria converted into office complexes or showrooms for automobile companies.